We’re in the last week of November (I know, time flies!) and that means we’re in the last week of NaNoWriMo, or National Novel Writing Month for those who still don’t know what that means. Last night I crossed the 45,000 word mark, meaning I only have 5,000 more words I need to write this week and I will have accomplished NaNoWriMo for the 8th straight year. Finishing NaNoWriMo is always a great accomplishment for me – it helps me learn writing discipline, gives me an excuse to cut out distractions in November, and also gives me a draft for an upcoming self-published book. At the same time, I’m always a bit relieved when NaNoWriMo is over with because it means I can move that off my plate and move onto other projects I’ve had waiting in line. This is particularly true of this year, because November has been mostly consumed with NaNoWriMo and the formatting and completion of the fourth (and final full-length) novel in my Black Earth series, Exodus. I just received the proof copy of the paperback version of Black Earth: Exodus in the mail yesterday and from what I’ve seen, it came out without needing anymore revisions to the formatting or cover – meaning the release is imminent. So with NaNoWriMo and Black Earth: Exodus moving off my plate, I can start pushing some marketing out the doors for Exodus, the Black Earth series as a whole, and the rest of my writing. I also want to dive into creating some merchandise through Zazzle, and put some more time and effort into building The Crossover Alliance community. Great things are on the horizon! But, one thing at a time. 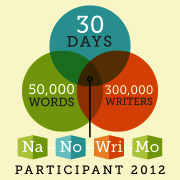 I still have 5,000 more words to write in my NaNo novel before I can claim victory, so I’ll see you on the other side.